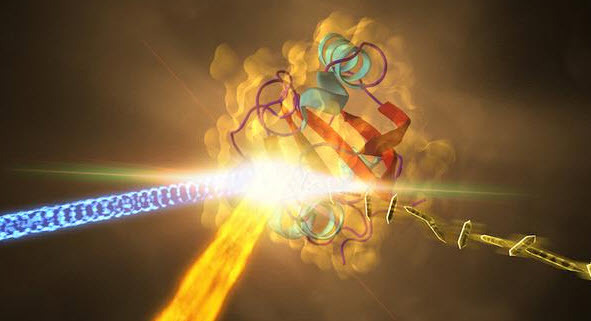 An international team led by Prof. Marius Schmidt from the University of Wisconsin-Milwaukee has imaged a light-sensitive biomolecule with an X-ray laser at unprecedented atomic spatial resolution and ultrafast temporal (time) resolution, as the scientists write in the journal Science. For their ultra-fast snapshots of the PYP dynamics, the scientists first produced tiny crystals of PYP molecules, most measuring less than 0.01 millimeters across. The microcrystals’ photocycle was kicked off by blue laser pulse and then the microcrystals were sprayed into the focus of the world’s most powerful X-ray laser, the LCLS at the SLAC National Accelerator Laboratory. The extremely short, intense X-ray flashes of the LCLS allowed the researchers to watch how PYP changes its shape at different time steps in the photocycle, by taking snapshot X-ray diffraction patterns. With a resolution of 0.16 nanometers, these are the most detailed images of a biomolecule ever made with an X-ray laser. The diameter of the smallest atom, hydrogen, is about 0.1 nanometers. Also, thanks to the high temporal resolution, the X-ray laser could, in principle, study steps in the cycle that are shorter than 1 picosecond (a trillionth of a second) — too fast to be caught with previous techniques. The ultrafast snapshots can be assembled into a movie, showing the dynamics in ultra slow-motion. Compared to other methods, X-ray lasers offer two major advantages for the investigation of ultrafast dynamics of molecules: the most brilliant X-ray flashes on earth and femtosecond time resolution. A femtosecond is a quadrillionth of a second (or one thousandth of a picosecond). While 40 femtosecond X-ray flashes were used for this experiment, the pulse duration can be made even shorter — down to just a few femtoseconds. “You need a short pulse to resolve the steps of these fast processes,” says co-author Dr. Anton Barty, also from DESY. “The short flashes also overcome the problem of damaging the often delicate samples with the intense X-rays.” Although the powerful pulses usually vaporize the sample, they are so short that they produce a high-quality diffraction signal on the detector before the sample disintegrates. This principle, called diffraction before destruction, was proven a few years ago by an international collaboration led by DESY. The team included researchers from the University of Wisconsin-Milwaukee, Arizona State University, SLAC National Accelerator Center, Lawrence Livermore National Laboratory, DESY, University of New York Buffalo, University of Chicago and Imperial College London. 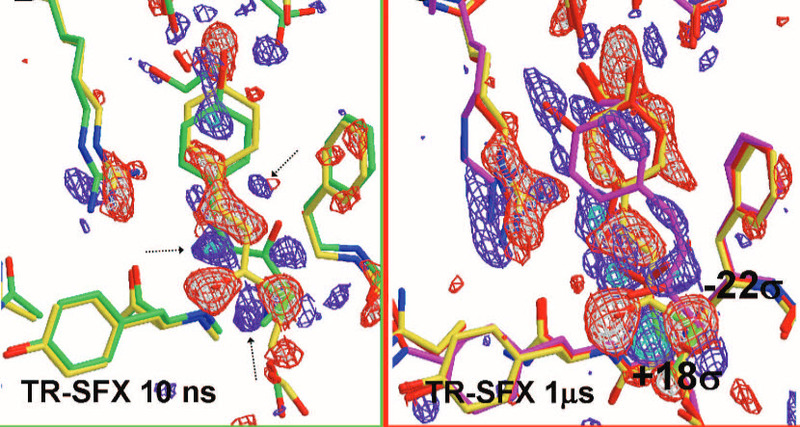 Serial femtosecond crystallography using ultrashort pulses from x-ray free electron lasers (XFELs) enables studies of the light-triggered dynamics of biomolecules. We used microcrystals of photoactive yellow protein (a bacterial blue light photoreceptor) as a model system and obtained high-resolution, time-resolved difference electron density maps of excellent quality with strong features; these allowed the determination of structures of reaction intermediates to a resolution of 1.6 angstroms. Our results open the way to the study of reversible and nonreversible biological reactions on time scales as short as femtoseconds under conditions that maximize the extent of reaction initiation throughout the crystal.